Our annual winter backpacking trip into Elk Lakes Provincial Park in British Columbia is becoming an anticipated family tradition with us. 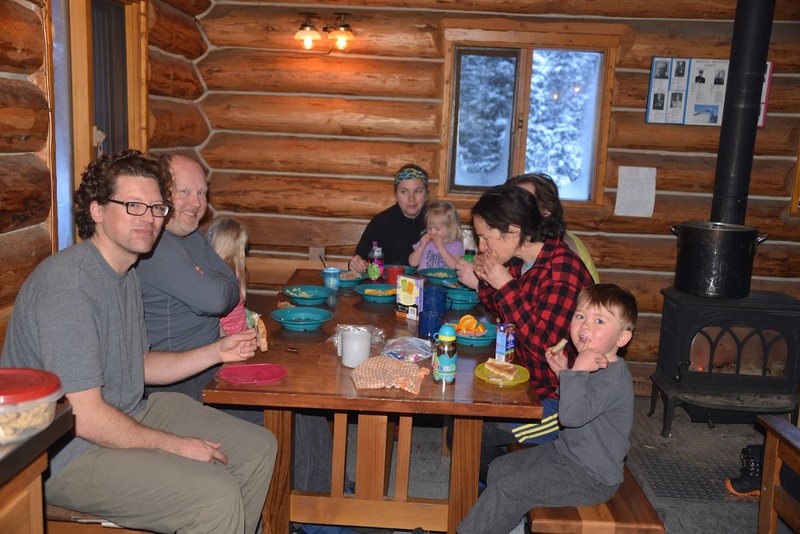 We made our first family trip to the Alpine Club of Canada's Elk Lakes Cabin last April on a cold and snowy weekend that felt more like February than April. 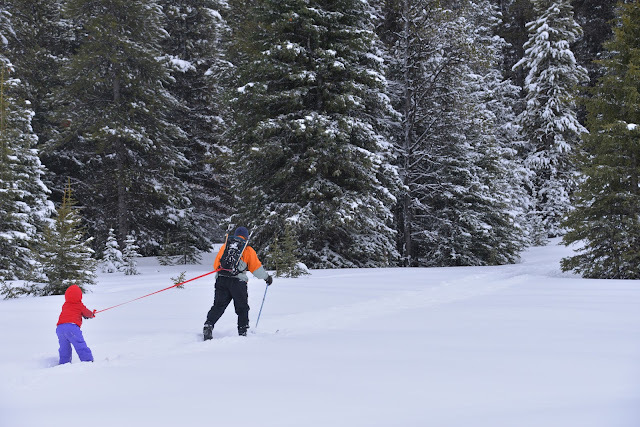 Last year we chose to snowshoe, not knowing what conditions would be like in April for skiing, but this year we decided to ski the 9km to the cabin - and go in a little earlier in the ski season. 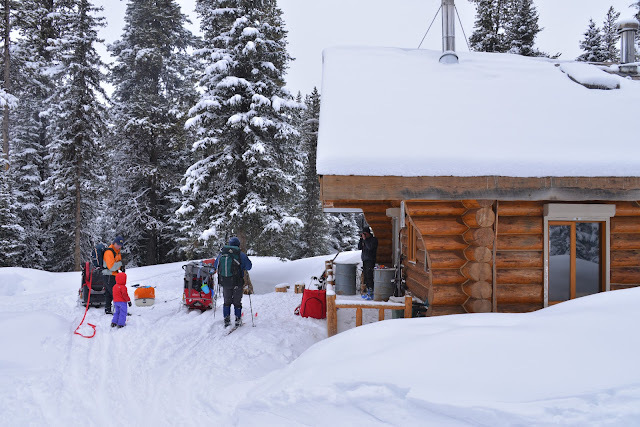 We planned the trip for Mid March, hoping it would be a warm weekend and that we would be able to sit on the sunny deck in the afternoon, sipping hot chocolate and Baileys while watching the kids play in the snow outside the cabin. We gathered 4 other families to come with us, 14 people in total, and 6 children under the age of 5. 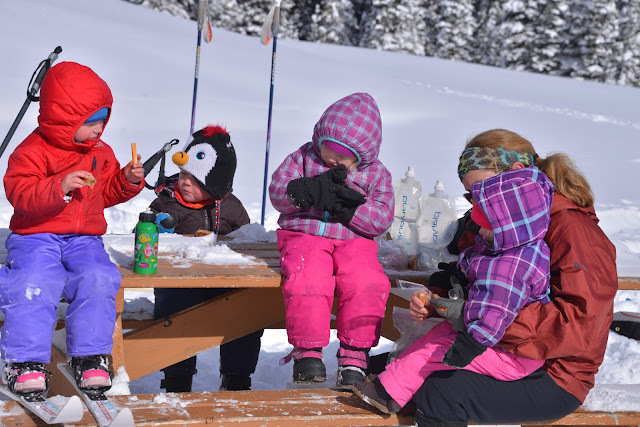 We would pull the kids to the hut in sleds and bring along toddler sized skis and snowshoes for exploring when we got there. However, plans change and by the day of the trip we were down one family due to a sore back that wouldn't permit carrying a heavy pack while pulling a 4 year old in a sled for hours. Still, we had 5 children and 4 families total - it was going to be a blast. Then,the trip leader got sick - yep, ME. I got so sick on my way home from Mexico that I spent 24 hours in bed right before the ski trip and knew I'd never make it to the cabin. 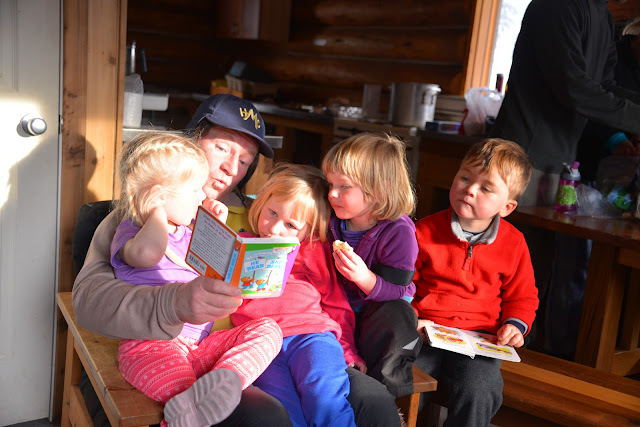 I convinced my husband to go without me and to take on the role of fearless trip leader so that our son could still spend the night in his favourite camping house. 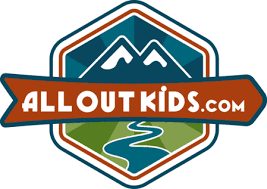 It would be their first father-son trip into the mountains for an overnight adventure. How would it go? And, that's where my trip report ends. After all, I was at home in bed during the ski into the cabin and spent most of the weekend passed out on the sofa. Fortunately I convinced one of my friends to finish the story for you. Her report is below. I hope you enjoy it! I've also added her photos to the story. Thanks Jen so much for sharing with us. 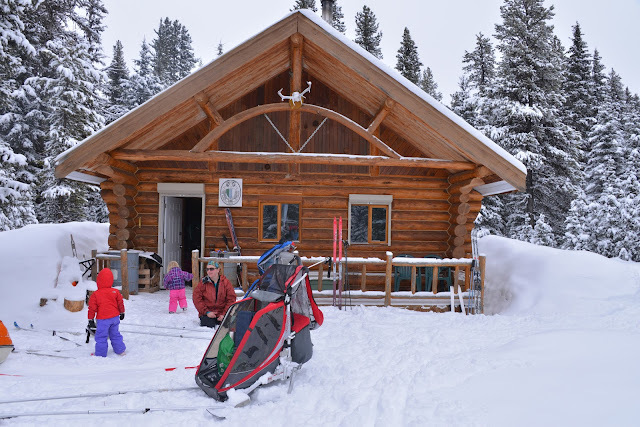 I must say I felt a little uneasy about our overnight back country ski trip into Elk Lakes Cabin with 3 other families when driving from Calgary in -13 degree Celsius blizzard conditions. 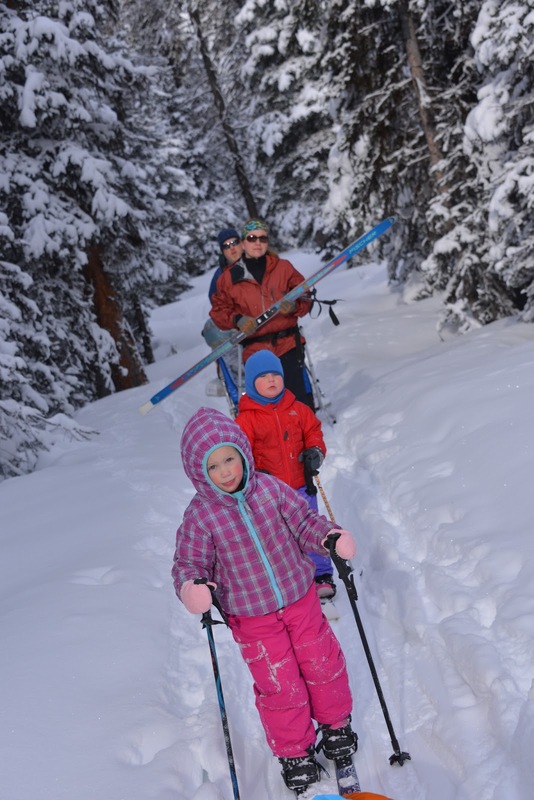 This would be our family's first back country ski trip with a young child that was remotely close to winter camping. You could call it winter "glamping" as we would ski into a back country cabin that possessed most of the modern hut amenities. 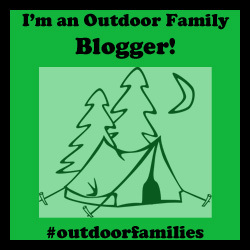 We would not have to set up, carry a tent and camping gear. The trip would entail a 9.2 km back country ski into Elk Lakes Cabin towing over 300 lbs. in gear and kids amongst 4 families, 2 of which were single parenting for the trip. This was definitely not a trip for the faint of heart, as carrying heavy loads, tons of fresh snow and cold temperatures would make for very slow and arduous conditions. The Elk Lakes Cabin in BC can be accessed from Peter Lougheed Provincial Park in Alberta by parking in the Elk Lakes Parking lot and skiing the 5 km track set trail up to Elk Lakes Pass. From there you can take the power line down the other side of the pass into British Columbia if the conditions are good . Another option is to take the switchback maintenance road which also descends the pass to the cabin. You then head 100 meters west at the bottom where you see the sign for Elk Lakes Provincial Park. As our family waited for the others to arrive, we hoped everyone would brave the storm. Of the interested 14 people, kids included, 11 managed to make it out for our big adventure. Unfortunately Tanya the organizer of our ski trip was laid up with the Mexican flu and regrettably could not join us. The other family of 2 was also unable to make it out. 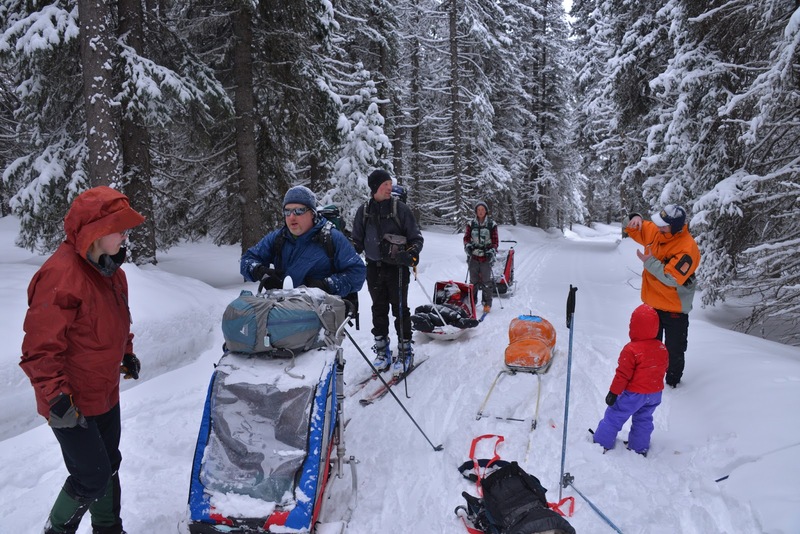 The composition of our group consisted firstly of a family of 4 who were pulling the ultra heavy double chariot with ski attachment, 100 lbs plus with their 2 children. 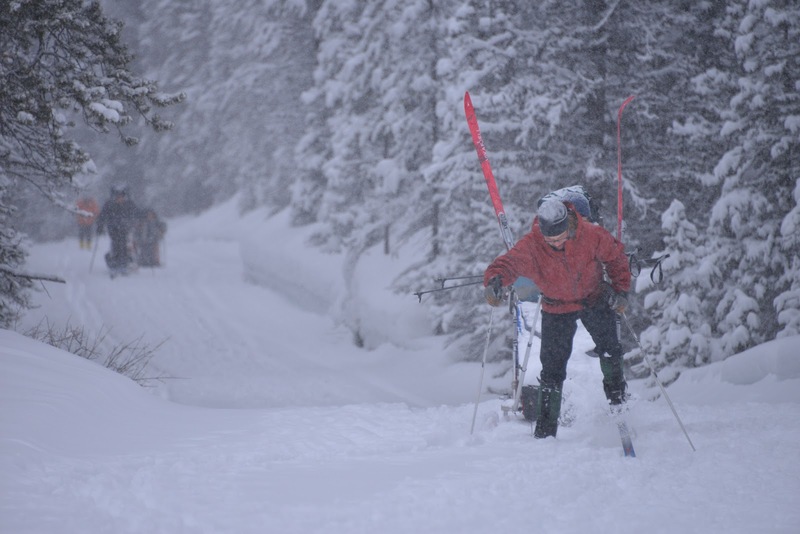 They were on metal edge cross country skis without skins. Another mom with her daughter left their younger family member and husband at home. She also pulled a double chariot while on cross country skis with skins. 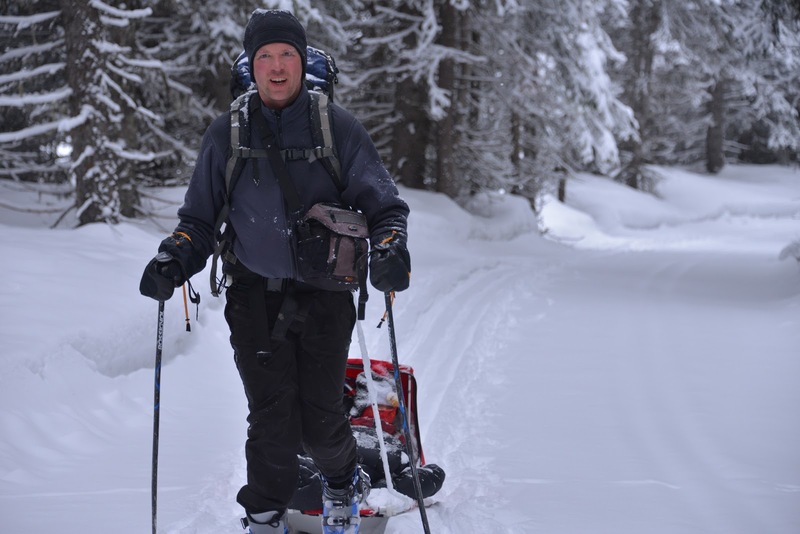 Tanya's husband on alpine touring gear with skins, pulled a pulk with all their gear and son, probably 80 lbs. plus. 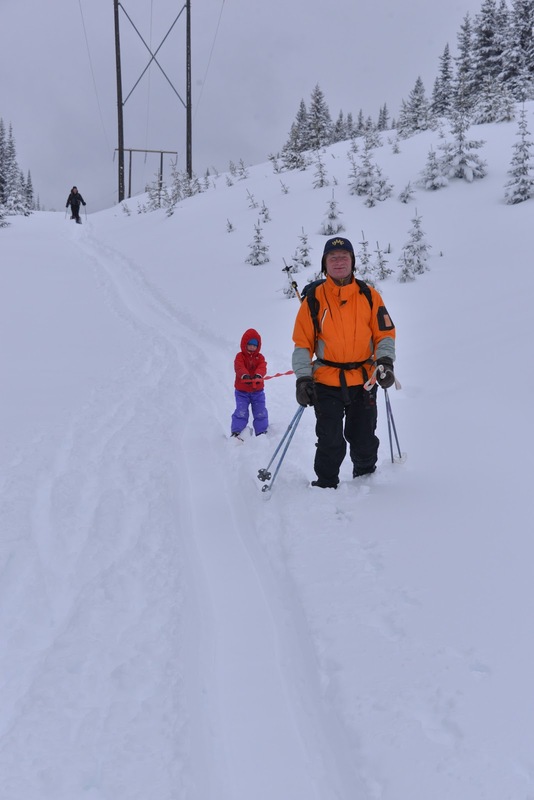 Lastly, our family on metal edge cross country skis pulled a pulk with gear and our 3.5 year old daughter with a tow rope. 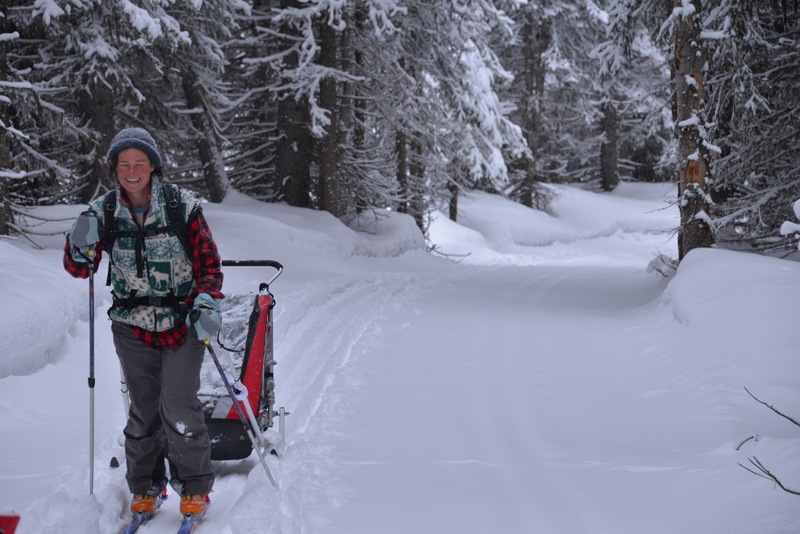 This was appearing to be more like an expedition as opposed to a leisurely back country ski. 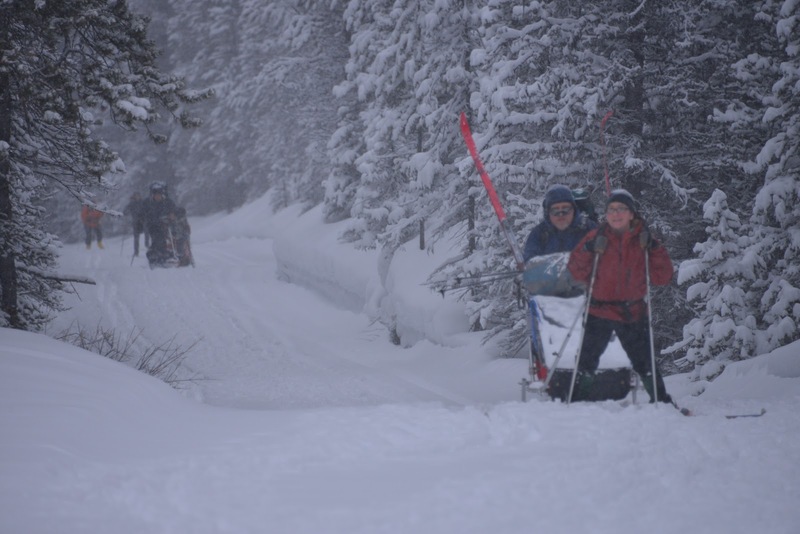 Teamwork was put into play again as we made our way up to Elk Pass. The 5km trail up to Elk Pass was fairly straightforward and track set. The heavy double chariot, however, could not make it up the steep hills without help pushing it from behind. The chariot and pulk with the kid riders could be pulled up with skins, but without skins the same help pushing would have been required. 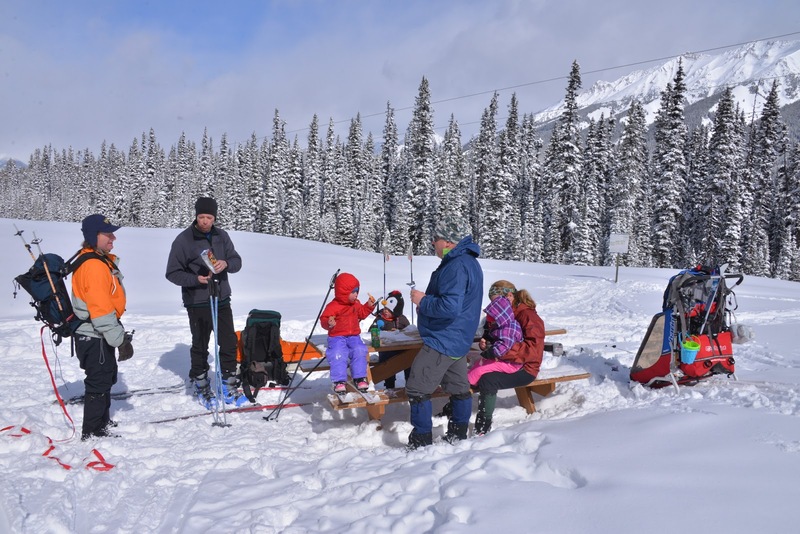 Once we reached the second rest stop at the top of the pass we had a quick lunch at a picnic table. A bit hurried we then plodded on as there was quite a wind chill with the cold temperatures and we were worried the kids would get too cold, not mentioning the adults. With wonderful powder ski conditions we followed the powerline down from the pass. Additional challenges were keeping the heavy kid laden pulks and chariots from tipping over on some side slopes. 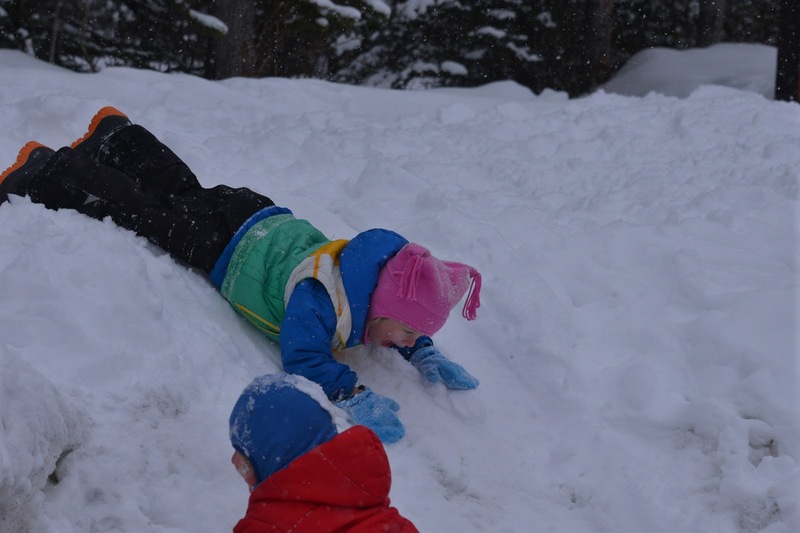 My daughter and husband also had frequent stops as she made a game out of dropping the rope and playing in the snow. Through the tough trail breaking and lots of sweat and calories burned, we managed to arrive at the cabin. Once in the cabin, the kids settled in by running around playing upstairs in the loft jumping on the cushions followed by running around the stairwell playing tag. The adults went to work doing the usual hut chores starting a fire, chopping wood, hanging wet clothes, fetching water from the creek, and making sure the kids were still in one piece. Once we settled in, the adults could relax as the kids played with glow sticks, read books and colored on wipeable doodle cards. 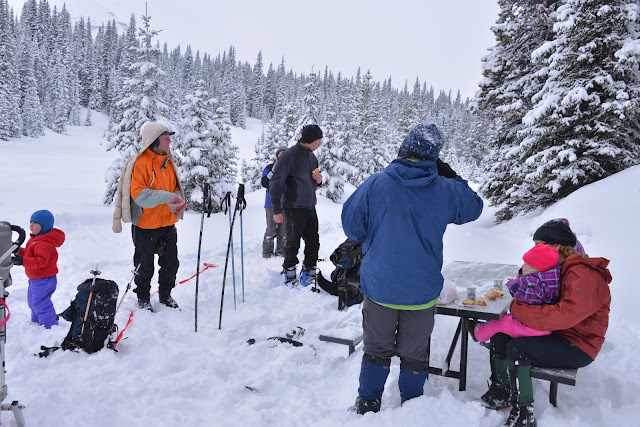 We enjoyed a gourmet dinner of spaghetti and meat sauce, garlic bread and a green bean side dish, all being extra tasty after a long hard ski; and the kids loved it too. Once the dishes were done the adults and kids were so tired we all went to bed at the same time - quite early indeed. The cabin sleeps 14 adults comfortably in an upstairs loft, so we had plenty of room to spread ourselves and gear out without being too close to others. There is also a room downstairs with a bunk bed. 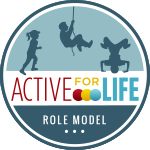 After a somewhat restless sleep, the adults packed up while the kids went outside to burn off some more energy. 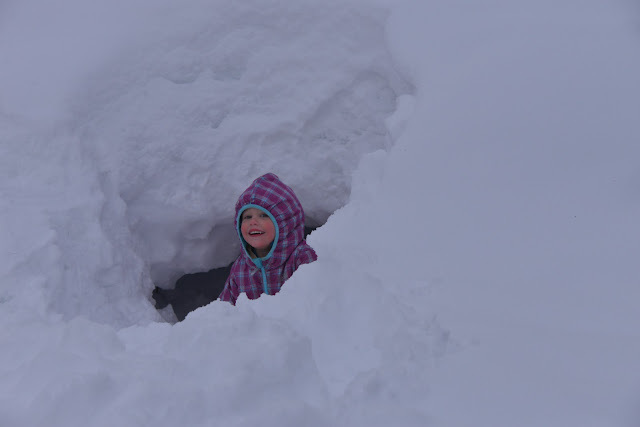 The kids had a blast making snow angels and playing in an existing snow fort. 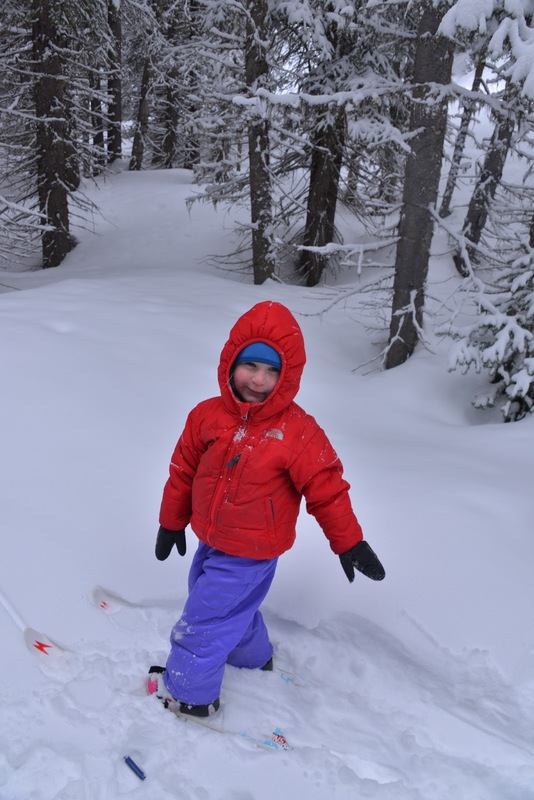 They also did a little of their own snowshoeing and cross country skiing. The journey back to the cars was also not without challenges, as one of the members had flu-like symptoms and nausea so we swapped gear to make his load lighter at times. We initially opted to take the less steep switch back trail and then connect with the power line trail half way up. With all of our team work ie. 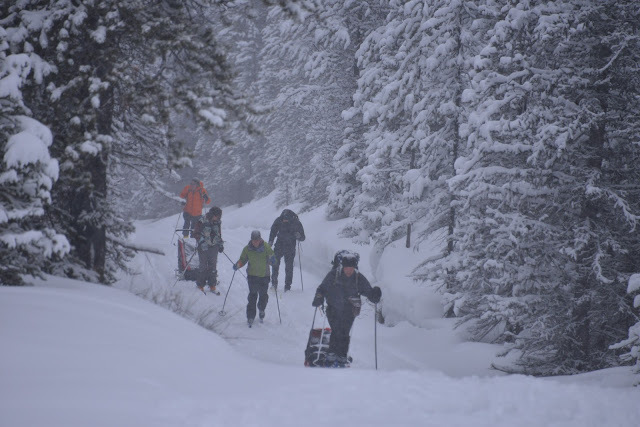 breaking trail in knee high snow, pushing the chariots up the steep sections, swapping gear amongst the parties to make the load easier; we managed to make it back to the cars not so worse for wear. We suffered from some bruised hips, blisters, and minor fatigue, but happy we survived a winter back country trip with kids. I think for all of us it was a memorable trip as friendships grew stronger and we had delight in seeing the kids have so much fun "winter camping in the big cabin." 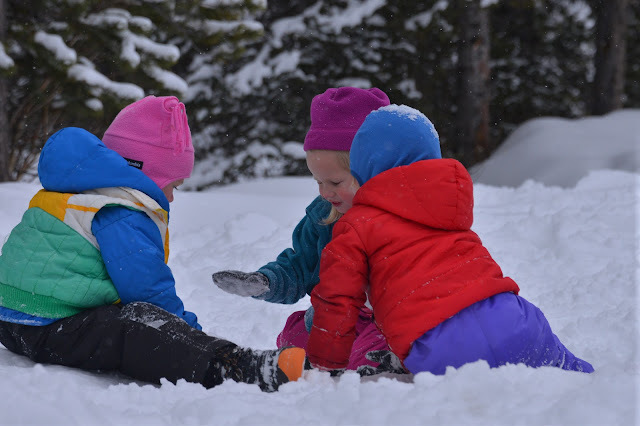 The kids still had lots of energy to play hide and seek and slide down the snow banks in the parking lot until the final cleanup and car packing was accomplished with everyone feeling quite tired but fulfilled! I'm sure next years back country trip will look quite different as the kids have almost outgrown their pulks and chariots. A few members of the party mentioned this would be their last long back country trip pulling kids in a sled, but also mentioned fond memories of their previous trips with the kids. 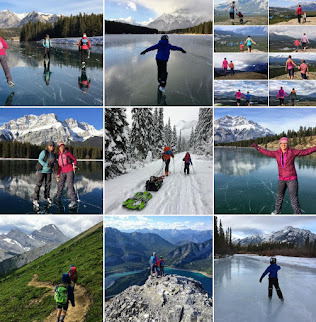 I think we all agreed that we are determined to get our kids skiing and not just going along for the ride for future trips! I want to say thanks to Jen for writing this awesome story. If you want to see more stories from Jen in the future please leave comments for her below. 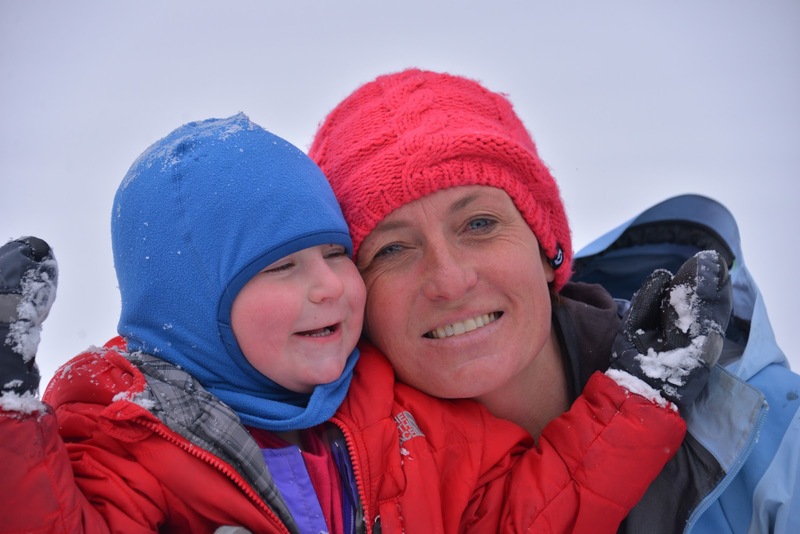 She is one heck of an outdoor mom and we are blessed to have met their family through our Outdoor Play group. All photos and story courtesy of Jen Sollid. Finally, I have a feature story in the spring edition of the Alpine Club of Canada's Gazette Magazine right now titled "Family Shares Adventures at Elk Lakes Cabin." As you can see, it has been a favourite subject of mine to write about. Fantastic job on the story Jen! You are a braver skier than I!